This is another in my “Short Lives Remembered” series. It is another child discovered as a direct result of the General Register Office (GRO) birth and death index search facilities introduced in 2016. I’ve not found any baptism details for this child. She was born and died in between censuses. Her burial gives no family details. So tracing her relied on civil registration and mother’s maiden name in the new search options. What I find most shocking about this child is the cause of death, which is put down to an ordinary, if painful and occasionally distressing, right of passage for babies and toddlers today. Ann Jennings was born on 12 February 1869 at Carlinghow Lane, Batley. The daughter of coal miner Herod Jennings and his wife Ann Hallas, she had 10 older siblings. All were still living by the time of Ann’s birth. This was no mean feat in an era of high infant mortality, when the most seemingly trivial illness or incident could extinguish life. Poverty, locality, environment, housing, sanitation, medical care, public health and class all played a part. The 34th Annual Report of the Registrar General (1871) illustrates the perilous nature of early years survival. Looking at the under 5 age-group, between 1838-1871 out of every 1,000 girls, 62.7 died. The corresponding figure for boys was 72.6. In the five years 1866-1870 the figures were 63.4 and 73. And looking only at 1870, 64.4 per 1,000 girls under 5 and 75.0 of boys died. Ann Jennings was one of the girls in 1870. She died on 15 January 1870 at Spring Mill Yard. Cause of death was dentition. In other words teething. This seemed incredible, that something so innocuous resulted in death. Yes, it can be an unpleasant time. I remember my daughter’s intermittent episodes of irritability, sleeplessness, drooling, flushed cheeks and raised temperatures. Calpol and Bonjela became medicine cupboard staples during this period. Teething rings, some special cooling ones, were added to her array of toys. But that’s as far as it went. I never realised it could be a cause of death. So I investigated further – and became more astounded at how common it was. A bit of background first. As with many childhood development milestones there are no hard and fast dates for the emergence of that first set of baby teeth. It normally starts at around the six to nine months stage, with each of the 20 teeth taking about eight days to emerge. The whole process lasts for around two years. Back to the Annual Report of the Registrar General. This time I looked at the 33rd report covering the 1870 statistics, the year of Ann’s death. In the West Riding of Yorkshire 232 female deaths and 287 male deaths were attributed to teething. In total 4,183 deaths registered in England had teething as the cause. In 1783 Frenchman Jean Baptiste Timothée Baumes wrote “A Treatise on First Dentition and The Frequently Serious Disorders Which Depend on It”. 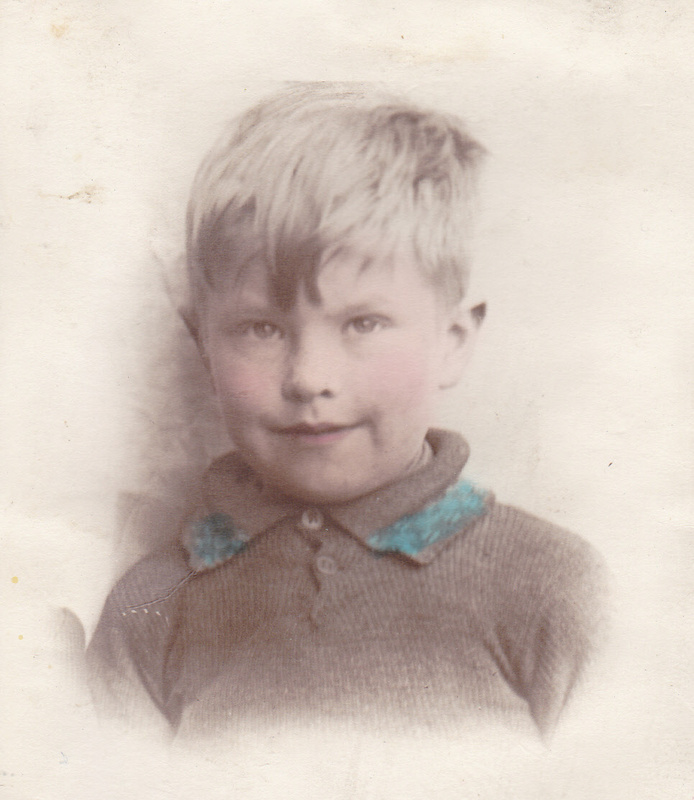 In it he claimed teething “….may often be be found the cause of death of a great number of infants”. The view was still prevalent almost a century later. 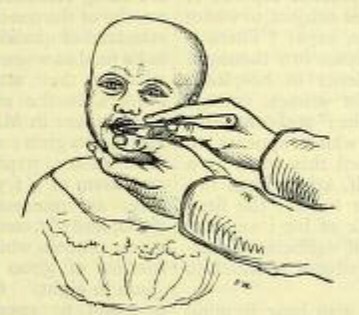 According to the 35th Annual Report of the Registrar General, looking at 1872 statistics: “Teething is one of the first marked steps in development after birth, and by inducing convulsions and other irritative reflex diseases, it is chargeable with a certain number of deaths”. The conclusion reached by medical professionals of the time was because the teething coincided process with the ages of high mortality, it was actually responsible for infant illness and death. According to accepted medical wisdom teething led to a number of afflictions and displayed a variety of symptoms including convulsions, diarrhoea, bronchitis, croup, vomiting, neck abscesses, insanity and meningitis. The teething phase was perceived as fraught with risk, a process to be dreaded. Added to misdiagnosis, teething treatments could in themselves prove fatal. Even today there are stories of homeopathic teething tablets causing death. Back in the 19th century treatments ranged from dangerous to downright barbaric, with some treatments a combination of the two. What could you do to make the passage of teeth through gum easier? Well, the obvious answer was to lance the gum, making a deep incision to facilitate the emergence of the offending tooth. This in a pre-anaesthetic, pre-sterilisation era carried it’s own risks. Leeches applied to the gums provided another solution. And what could you do to relieve the pain, reduce excitement, regulate the bowels and induce sleep in the restless teething babe? Newspapers were full of the answers, with adverts for soothing remedies which parents, fearful of the dangers of dentition, were induced to purchase. In this unregulated, uncontrolled period of medicine druggists and pharmacists made their own propriety and patented concoctions with no details of ingredients. But these included opium, cocaine, mercury, morphine and alcohol, with rubbing whisky in gums of teething children even touted in more recent times. All of these could lead to addiction and death. The risk was not unknown. 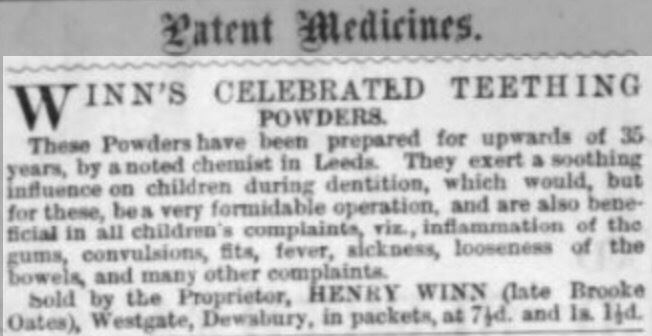 Cassell’s Household Guide of 1884 for instance acknowledged the danger of giving narcotics to children – but reassured parents that it was acceptable if such remedies were recognised as teething powders. So by trying to do the right thing and following advice, parents were in fact endangering their babies. In fact in 1869 a 9-month old girl from Gravesend, Catherine Sarah Cobham, was poisoned as a result of a chemist dispensing strychnine instead of powdered sugar as a teething remedy. Incredible too that sugar was touted for teething – presumably leading to tooth decay later if the baby survived! So who knows if Ann really did die as a result of teething. Was it actually a case of misdiagnosis, or even a teething remedy gone wrong. We will never know. So she is just another statistic, amongst thousands of others, whose death was attributed to dentition. Her funeral took place on 17 January 1870 at Batley Parish Church. 25 August 2014. A significant date for me. 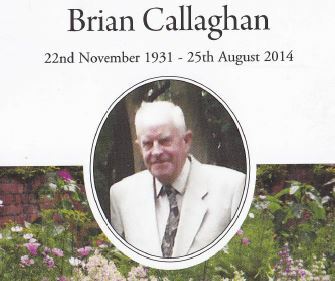 The day my uncle Brian died. The person responsible for my family history interest. In the days before online research, uncle Brian made a tentative start finding out about his family tree. He wasn’t a car-driver so he did it the hard way, visiting libraries and record offices by public transport. It was the story of my nana’s brother, who died after being knocked down by a car in 1910, which initially captured my interest. Seeing grainy photocopies of those old newspaper snippets, which uncle Brian had discovered trawling through library microfilms, kindled in me the desire to find out more. But it was a few more years before I did anything, not until my brother bought me some general family history research books for Christmas 2005. Since then I’ve been bitten by the family history bug. I’d share relevant finds with my uncle Brian, who married later in life and never had any family of his own. A distant relative once said about family history research, “you’ve got a mother and a father. That’s all you need to know“. I wanted to know far more than that. Uncle Brian too was so genuinely interested. And now I miss sharing my latest discovery with him; or asking questions about the “olden days“. I also regret not finding the time to ask more. I always remember as a child my parents would insist on having both the front and back doors open during a thunderstorm just in case a lightning bolt came down the chimney. I am not sure how common the open-door policy was in other households, but I assume it was adopted so that the bolt could exit the house. To be honest I have never been too keen on lightning myself. And I remember the inconvenience once when both my modem and computer were rendered beyond economic repair following a lightning strike. Perhaps my mistake was to keep the doors shut! But this was a minor nuisance in comparison to the tale I discovered in my family tree. My five times great-grandfather was Amos Hallas. Born in the West Riding village of Lepton, near Huddersfield, in around 1754 he was baptised at St John the Baptist, Kirkheaton later that year. He married Ann (Nanny) Armitage in the neighbouring parish of Kirkburton in August 1780 and the couple set up home at Highburton, a hamlet within the parish and township of Kirkburton. This is around five miles from Huddersfield. The predominant industry of this region was woollen textile manufacture, and Amos was described a fancy weaver. The area around Kirkburton was known for its fancy woven waistcoat fabrics so it is likely that Amos was engaged in this skilled occupation. These were difficult times for the textile workers as the period marked the early stages of the transition from domestic to factory-based operations, with 1776 marking the introduction of the first spinning jenny locally in the Holmfirth district. This was closely followed by the first scribbling engine being set up in around 1780 at Ing Nook Mill. By the end of the eighteenth century with the abundance of coal in the West Riding and the introduction of steam power the stage was well and truly set for the transformation of the area’s textile industries. At the same time this was the period of economic hardship with Britain at war with France almost continuously from 1793 until Napoleon’s defeat by the Duke of Wellington in the Battle of Waterloo in 1815. Alongside the threat of invasion, the French sealed off British exports to continental Europe, a campaign designed to cripple the economy. It nearly succeeded, British exports slumped with handloom weavers, such as Amos, the first to be affected. Unemployment and food prices soared. This toxic twin cocktail of industrialisation and economic distress was the fuel for the rise of the Luddites. From 1811-1816 these well organised gangs, smashed the new machines and burned down mills in an attempt to protect jobs. In 1812, the same year as Prime Minister, Spencer Percival, was shot dead by a ruined businessman a Marsden mill owner William Horsfall, known locally for his anti-Luddite stance, was also murdered. This event took place only around 11 miles away from Kirkburton/Highburton. Troops were stationed locally to deal with the marches, riots and machine-wrecking which had become a regular feature of British life. 12,000 were sent to Yorkshire in 1812 to stop this industrial sabotage. At its peak there were around 1,000 soldiers based in Huddersfield alone to deal with the threat. Kirkburton too, unsurprisingly, had its Luddite contingent. At the end of September 1812 residents John Smith and David Moorhouse were committed to York Castle on charges of “burglary under the colour of Luddism” resulting from a robbery at gunpoint at the home of another Kirkburton resident, Mr Savage, on 13 June 1812. So this tumultuous period is the backdrop to the life and times that Amos and Ann Hallas brought their family up in. Between 1780-1802 the couple had 13 children. 12 of these baptisms are recorded in the Kirkburton All Hallows parish register. The youngest child, baptism unrecorded in the register, has been identified from her marriage certificate, on the occasion of her second nuptials. My four times great grandfather, George Hallas, born in around 1794 was their 9th child. But it is their 12th child, Esther, who suffered an unusual fate. According to the parish register Esther was born on 27 July 1800 and baptised in the local church on 5 October 1800. She died only days before her 17th birthday. It is her burial record on 13 July 1817 at the same church which contains the helpful and fascinating notation: “killed by lightning”. More in hope than expectation, I followed up this discovery with a visit to Kirkburton All Hallows church. My family of coal miners and textile workers are not normally associated with headstones. At the time of my visit there was no churchyard guide so it was a case of wandering round on the off chance of spotting something. Imagine my surprise when I discovered a Hallas headstone – and what was more it proved to be a very unusual one. So the epitaph makes cautionary, poetic reference to the manner of her death. 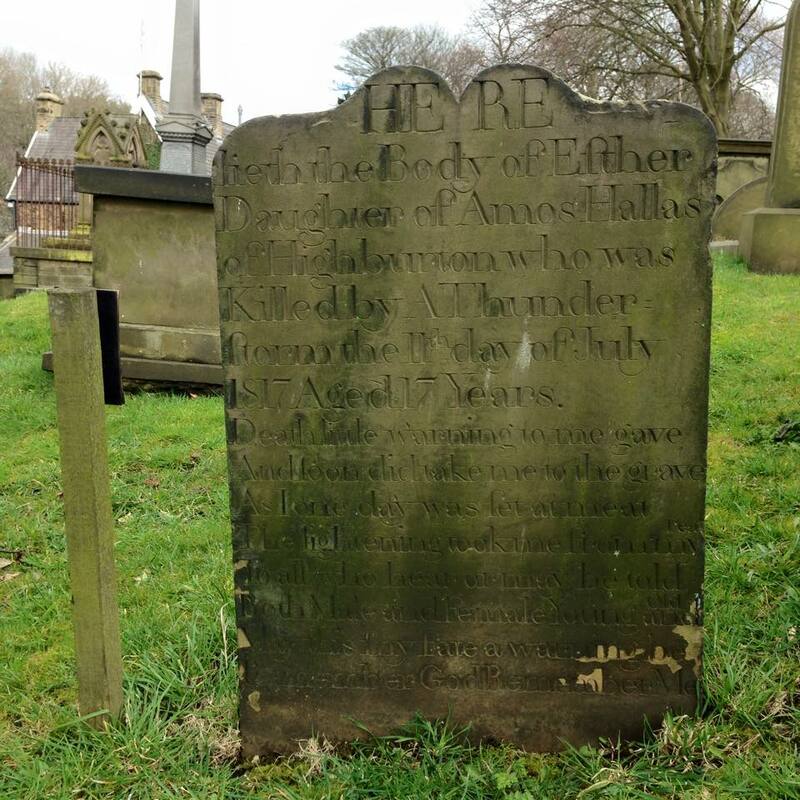 Since this initial visit the All Hallows Churchyard team have established a website with an inscription and location guide to the headstones which is invaluable to those with Kirkburton ancestry. “Yesterday se’nnight, a fatal accident took place at High Burton, near Huddersfield, during the thunder-storm on that day: The lightning struck the chimney of a house belonging to Mr Fitton, and having partially destroyed it, proceeded down the chimney, into the kitchen, and in its passage through which a servant girl was struck, and killed on the spot; the face of the clock was melted, and several panes in the window broken. Two men were also hurt by the lightning, but not dangerously”. Esther was not named but I assume that she was the servant girl referred to. So a case of how an entry in a burial register, a headstone and a newspaper report came together to tell a story. Esther’s father, Amos, died two years later in 1819 and her mother died in 1838, aged 82.